Let’s just say I am taking my time . . .
As the world hears about the latest evidence that the Shroud of Turin may have been the burial cloth of Jesus, some have expressed uncertainty about the latest claim. Giulio Fanti, a professor from the University of Padua, and Saverio Gaeta, an Italian journalist, have recently published a book arguing that the shroud did indeed exist during the time frame of the life of Jesus. 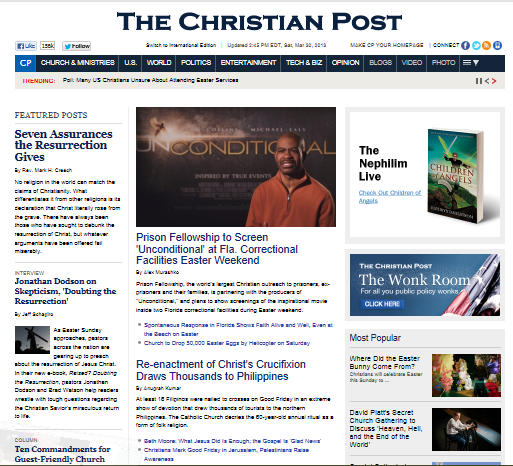 Dan Porter, who oversees a news blog about the shroud, told The Christian Post that from what he knew the research was based on "new methods that have not been peer-reviewed yet for publication in a reputable and ethical scientific journal." "I know Giulio Fanti personally and I know him to be an honest researcher. Frankly, I would have preferred it if he had sought peer-review before writing his book," said Porter. "Unfortunately that can be difficult where science meets religion. Let’s just say I am taking my time and seeking opinions from others before deciding." Porter also told CP that regarding the whole issue that the shroud "may be the real burial cloth of Jesus." "The carbon dating, once seemingly proving it was a medieval fake, is now widely thought of as suspect and meaningless. Even the famous atheist Richard Dawkins admits it is controversial," said Porter. "Years ago, as a skeptic of the shroud, I came to realize that while I might believe it was a fake, I could not know so from the facts. Now, as someone who believes it is the real burial shroud of Jesus of Nazareth, I similarly realize that a leap of faith over unanswered questions is essential." Oh, go ahead and read the rest of the story and see what Roy Speckhardt, executive director of the American Humanist Association, told the post. From the apse of the Resurrection Chapel of the Washington National Cathedral, Washington D. C. by Hildreth Meière (1892-1961), renowned mural artist and mosaicist. And He hath on His vesture and on His thigh a name written, KING OF KINGS, LORD OF LORDS. For I know that my redeemer liveth, and that He shall stand at the latter day upon the earth: And though after my skin worms destroy this body, yet in my flesh shall I see God. Behold, I shew you a mystery; We shall not all sleep, but we shallall be changed, In a moment, in the twinkling of an eye, at the last trump: for the trumpet shall sound, and the dead shall be raised incorruptible, and we shall be changed. In a moment, in the twinkling of an eye, at the last trump: for the trumpet shall sound, and the dead shall be raised incorruptible, and we shall be changed. For this corruptable must put on incorruption, and this mortal must put on immortality. So when this corruptible shall have put on incorruption, and this mortal shall have put on immortality, then shall be brought to pass the saying that is written, Death is swallowed up in victory. O death, where is thy sting? O grave where is thy victory? The sting of death is sin; and the strength of sin is the law. What shall we then say to these things? If God be for us, who can be against us? Who shall lay any thing to the charge of God’s elect? It is God that justifieth. Who is he that condemneth? It is Christ that died, yea rather, that is risen again, who is even at the right hand of God, who also maketh intercession for us. Saying with a loud voice, Worthy is the Lamb that was slain to receive power, and riches, and wisdom, and strength, and honour, and glory, and blessing. And every creature which is in heaven, and on the earth, and under the earth, and such as are in the sea, and all that are in them, heard I saying, Blessing, and honour, and glory, and power, be unto Him that sitteth upon the throne, and unto the Lamb for ever and ever. I join all of you gathered before the Holy Shroud, and I thank the Lord who, through modern technology, offers us this possibility. Even if it takes place in this way, we do not merely “look”, but rather we venerate by a prayerful gaze. I would go further: we are in fact looked upon upon ourselves. This face has eyes that are closed, it is the face of one who is dead, and yet mysteriously he is watching us, and in silence he speaks to us. How is this possible? How is it that the faithful, like you, pause before this icon of a man scourged and crucified? It is because the Man of the Shroud invites us to contemplate Jesus of Nazareth. This image, impressed upon the cloth, speaks to our heart and moves us to climb the hill of Calvary, to look upon the wood of the Cross, and to immerse ourselves in the eloquent silence of love. Let us therefore allow ourselves to be reached by this look, which is directed not to our eyes but to our heart. In silence, let us listen to what he has to say to us from beyond death itself. By means of the Holy Shroud, the unique and supreme Word of God comes to us: Love made man, incarnate in our history; the merciful love of God who has taken upon himself all the evil of the world to free us from its power. 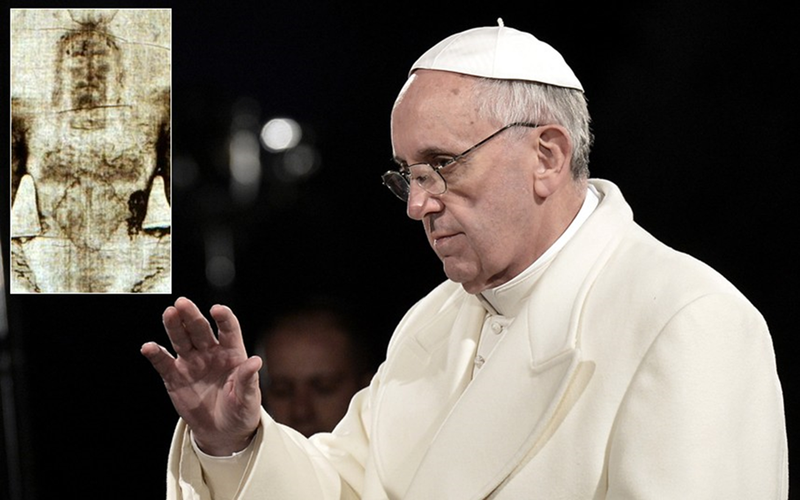 Francis referred to the 14ft-long strip of sepia fabric, which is imprinted with the face and body of a bearded man, as “the Holy Shroud” and asked: “How is it that the faithful, like you, pause before this icon of a man scourged and crucified? It is because the Man of the Shroud invites us to contemplate Jesus of Nazareth. He likened the look of suffering on the face of the man to the pain and horrors endured by the victims of modern war and conflict. Since being elected the successor to Benedict XVI earlier this month, the Argentinean Pope has repeatedly called for the need to protect the weak, vulnerable and dispossessed in society. The Pope sent the message as an introduction to a 90-minute broadcast on RAI, the state television network, from Turin Cathedral, where the shroud is kept in a special climate-controlled case. The broadcast on Saturday afternoon commemorated the 40th anniversary of the last time the shroud was shown for an extended period, live on Italian television, under Pope Paul VI in 1973. The Vatican has never pronounced one way or the other whether it believes the shroud to be genuine. Pope Emeritus Benedict XVI, when he was still cardinal Joseph Ratzinger, . . .
Video from Turin Appearing on YouTube. Expect More. We are starting to get video from today in YouTube. This clip runs about nine minutes. Amongst all the hoopla, I missed linking to this earlier. This is a very significant interview with Barrie Schwortz, founder and editor of Shroud.com with CNN about the appearance of the shroud on TV again, the failure of the carbon dating, the unsolved mystery of the image and the new iPhone app. Click HERE or on the image to watch this four minute segment. The Shroud.com story also carries an attack by the Turin authorities on Fanti’s claim that he had carried out tests on a fibers of the Shroud obtained from (ta da) Ray Rogers. The Turin authorities not authorized the fibers to be transferred. The Fanti research was thus unauthorized. I do not feel I can comment currently on Fanti’s “Mystery of the Shroud.” As of yet there is no English translation available. But I can comment on this: Roger’s 2005 statements are a “past recollection recorded.” While it was not contemporaneously recorded, it certainly is evidence of an chains of possession which began with Prof. Gonella, now deceased. It may be that the authorities in Turin do not wish to authenticate Fanti’s work by denying official confirmation of his samples authenticity. Yet, in law they have a principal of evidence expressed in Latin: Res ipsa loquitur.” The facts speak for themselves. Now read the whole posting. I agree with it.